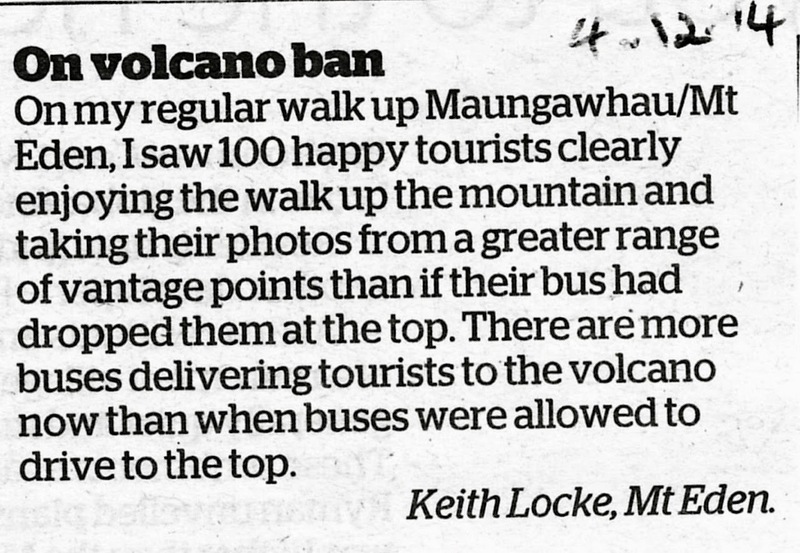 On 1 December the Maunga Authrority agreed in principle to extend a 2011 ban on buses driving to the summit of Maungawhau to all vehicles. 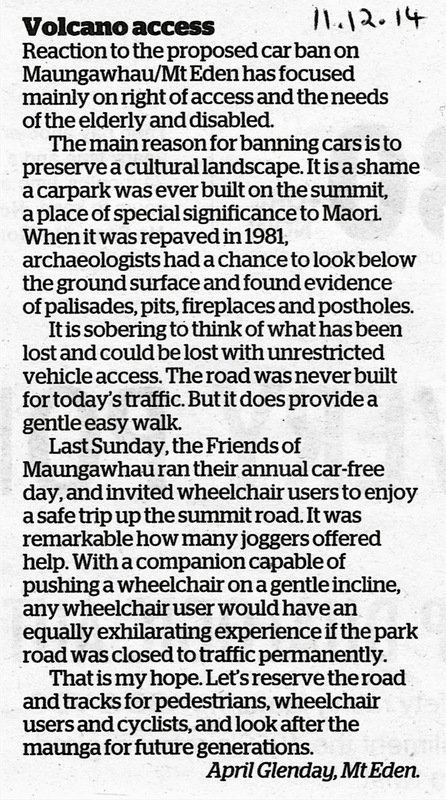 FoM believes that cars should be banned from the summit for two main reasons: firstly, so that the cultural landscape is preserved; and, secondly, for reasons of safety and enjoyment. The existing road was never built for the traffic loads that it now carries. The summit, instead of being a place of quiet to contemplate the superb views out to the twin harbours and beyond, is full of noise and polluting cars. The congestion creates safety issues. People on foot have to negotiate the summit area as cars move in and reverse out of parking spaces. 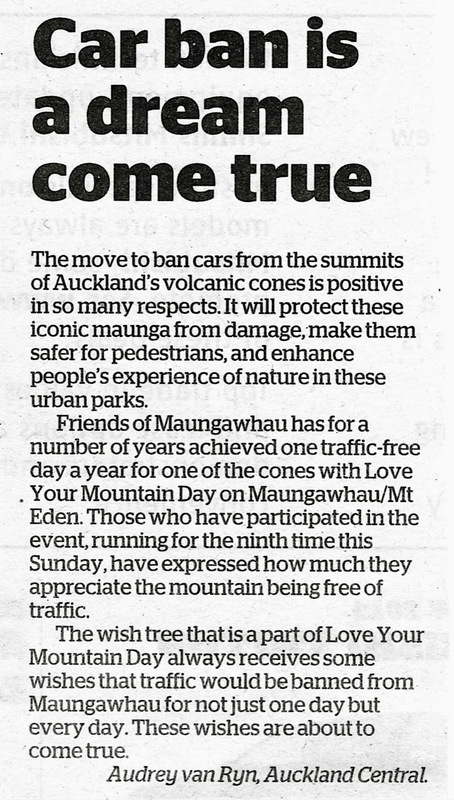 Without cars the summit will be a much safer place for all to enjoy. 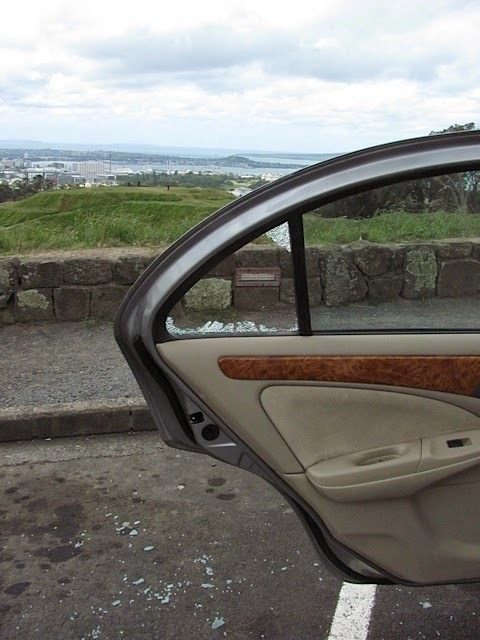 The ability to drive up to the summit encourages anti-social and criminal behaviour which deters those who want to enjoy the views and beautiful space that is the maunga. 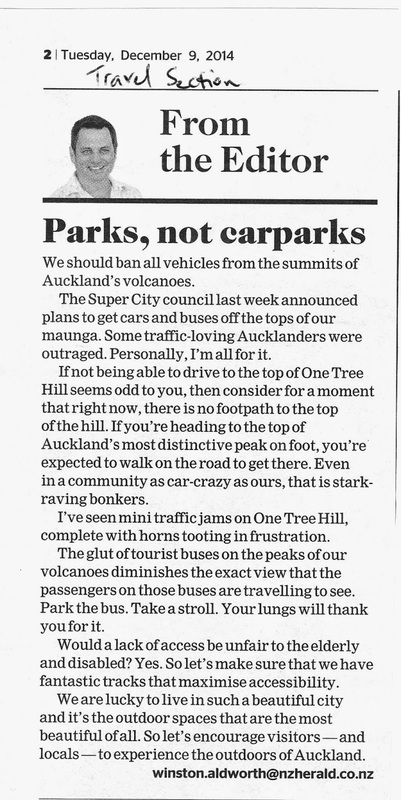 As said so well by the editor of the Travel section of the NZ Herald on 9 December 2014 (see below), the issue is parks, not car parks. 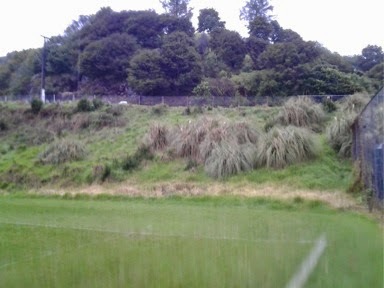 Maungawhau is one of Auckland's iconic volcanic cones. They are considered worthy of World Heritage status, but are not treated with the respect they deserve. Other places of historical and cultural importance do not have car parks plonked on top. Why should Maungawhau? 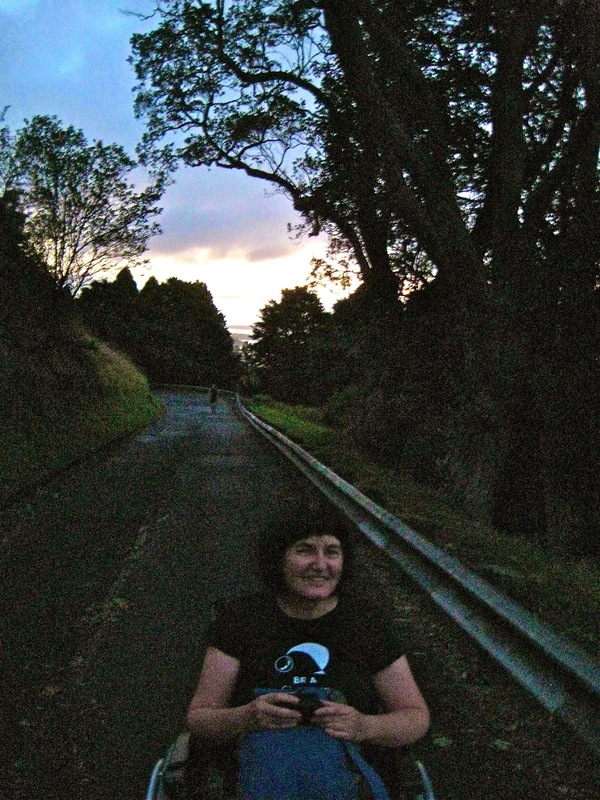 A final decision on the proposed car ban will be taken at the April 2015 meeting of the Maunga Authority. Access for those with restricted mobility will be part of the decision and implementation process. We invite you to read the following letters and opinion pieces from the media and FoM members. We had lots of fun setting up the Wish Tree and manning it for the Love Your Mountain Day. Christmas can wait - it's two weeks until Love Your Mountain Day! 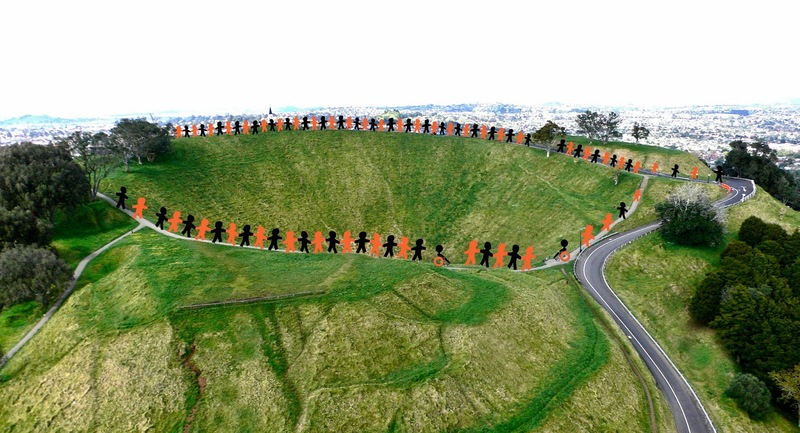 The programme has been finalised, this week flyers are hitting letterboxes around Mt Eden, and the event listing will appear along with the image of people around the crater rim in the upcoming OurAuckland mini magazine. a mau rākau demonstration at Government House grounds by Malcolm Kerehoma. It's taken three years of work, two total redrafts, and many hours of debate and discussion among the "booklet team", but at last our book is printed and ready to face the reading public. 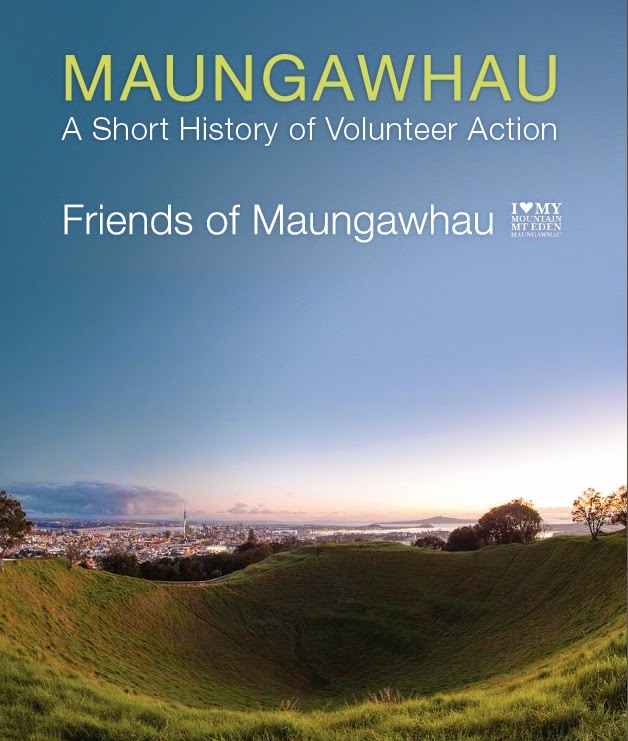 As you might guess from the title, Maungawhau: A Short History of Volunteer Action is a record of our history, campaigns and restoration work on Maungawhau. It also explores the many difficult issues involved in preserving and caring for volcanic cones, and argues for the legitimacy of our attempts to restore scoria-cone forest on land classed as an archaeological site. The "booklet", as we've always called it, has grown into an absorbing and well produced 116-page illustrated book with maps, sketches and historical photos. Preparation and production was funded by the ASB Community Trust. We thank the Trust for their patience and support. 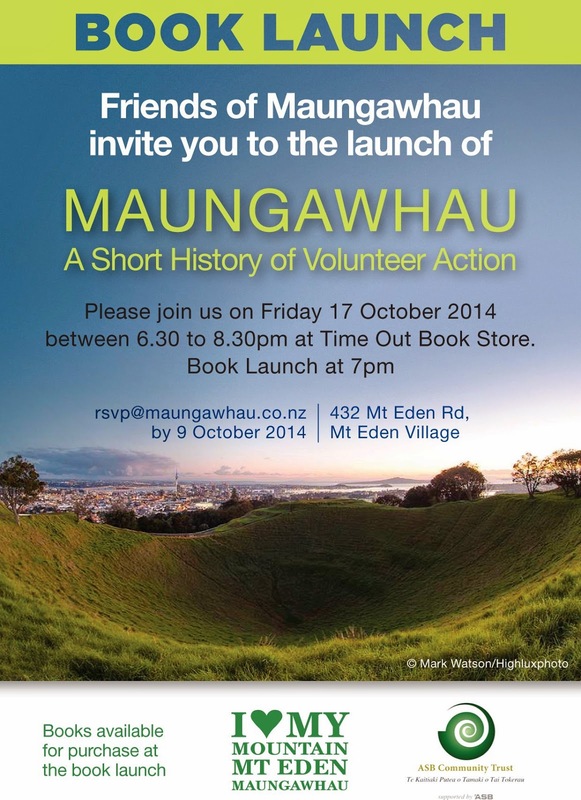 Chapter 1 outlines the mountain's history and the founding of the Friends of Maungawhau in the 1980s. It discusses the dual reserve classification, Auckland Council's conflicting policies and plans, and FoM's role in the removal of buses from the summit and the cessation of grazing. 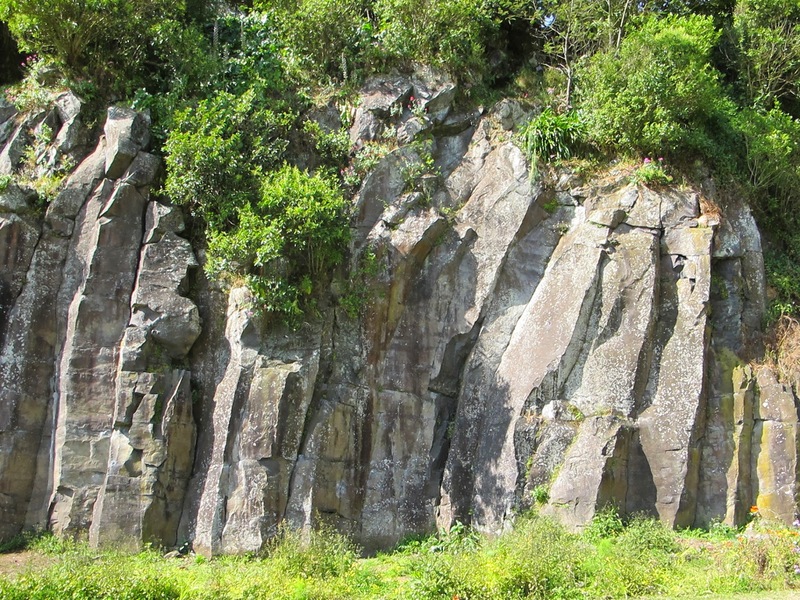 Chapter 2 describes the geology and ecology of Maungawhau, its vegetation history, weed problems, and the value of the mountain from the human perspective -- cultural landscape, open space, and viewing platform for visitors. Chapter 3 takes a look at our practical volunteer work on the ground. It describes our revegetation efforts and the weeding and planting techniques we have developed for a uniquely steep, drought-prone, and unstable site. Five examples of Jean's weekly Tuesday reports (270 produced to date) make fascinating reading. Chapter 4 discusses our education and advocacy roles as champions for better management and appreciation of volcanic landscapes. It argues that a professional, well-resourced ranger service for the cones is the only way that sustainable day-to-day management can ever be achieved. 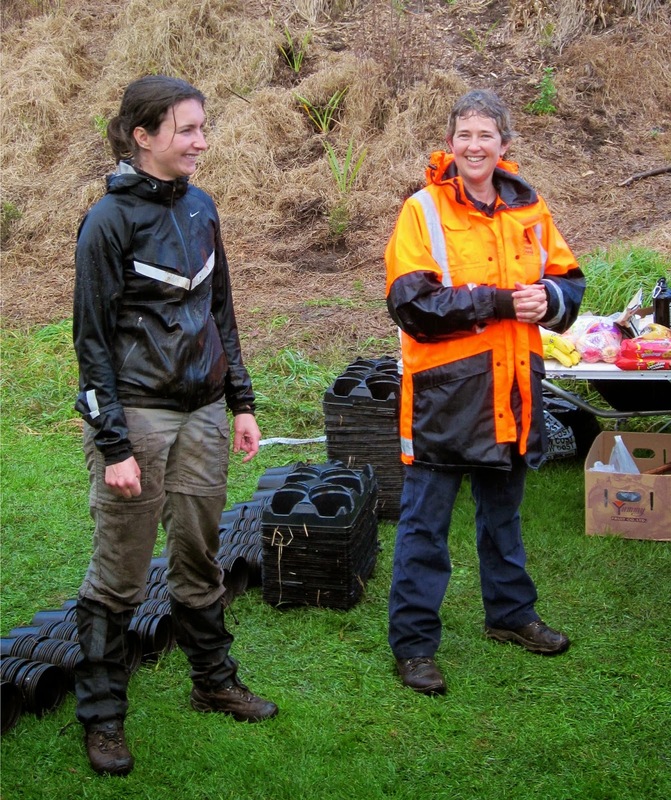 Chapter 5 presents the challenges that we face as a volunteer group caring for the Maunga. 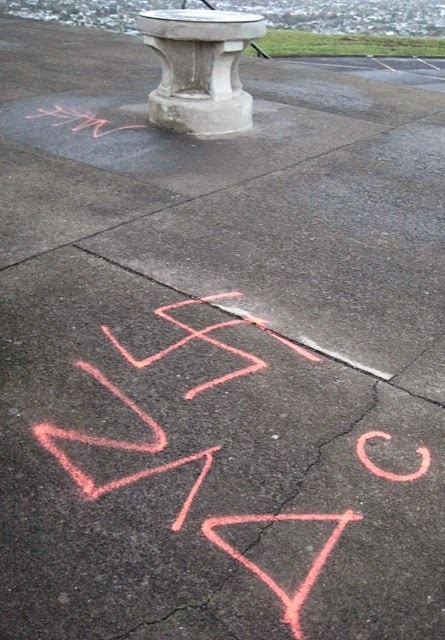 It ends with the hope of greater inclusiveness and recognition of the knowledge held by the volunteer community with the advent of the new Council/iwi co-governance structure for the volcanic cones (a.k.a the Maunga Authority). The five appendices include a statutory framework diagram and comprehensive plant species lists: a list of FoM's recommended native plants and a list of the main environmental weeds that have naturalised on Maungawhau. The final pages include a bibliography, walking map and our vision statement. The book is dedicated to renowned archaeologist Dr Sue Bulmer who has been a leading light in FoM and a feisty critic of past management policies and abuse of the Maunga. So, if you've read this far and want to get your hands on a copy, come to our book launch or order a copy from us: sales@maungawhau.co.nz. The cost is $20 plus P&P ($3 within NZ). 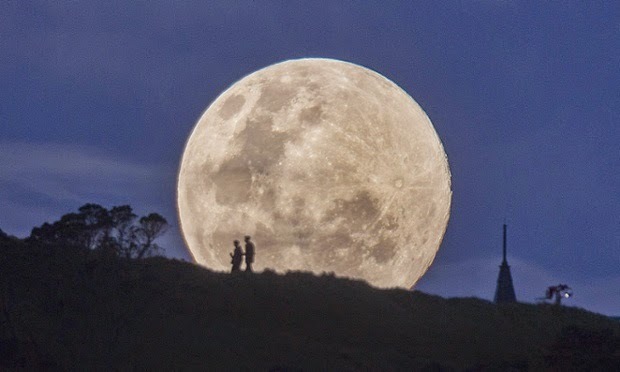 In case you missed the photo in the NZ Herald of the super moon and our super maunga, here it is, and if you go to this link you will see it at the top of a page that features photos of the super moon taken from different locations around the world. This photo is by Simon Runting/Rex. World Ranger Day is observed on 31 July, the anniversary of the founding of the International Rangers Federation in 1992. It is a time to celebrate the dedication of park rangers around the world who protect parkland and animals, and to remember the approximately 1,000 rangers who have been killed or injured in the line of duty in the last ten years. to get a word in when there are politicians about – but the Duke of Cambridge was kind enough to stand in for him. He did a creditable job, without matching Kit's passion for the subject, as did Dame Jane Goodall. You can listen to their messages on the International Rangers Federation website. This week will see an historic occasion with the passing of the Maunga Bill [ Ngā Mana Whenua o Tāmaki Makaurau Collective Redress Bill ]. It also comes in the year of the World Parks Congress which is examining the state of the world’s protected areas or parks. It is good to celebrate the new governance, however a “watchful eye” is needed for there will be many challenges. These include dealing with the pressure of use; delayed maintenance, pests and weeds and different management philosophies - all of which will rest on rate payers. In some ways the Crown has passed the financial buck onto Aucklanders. 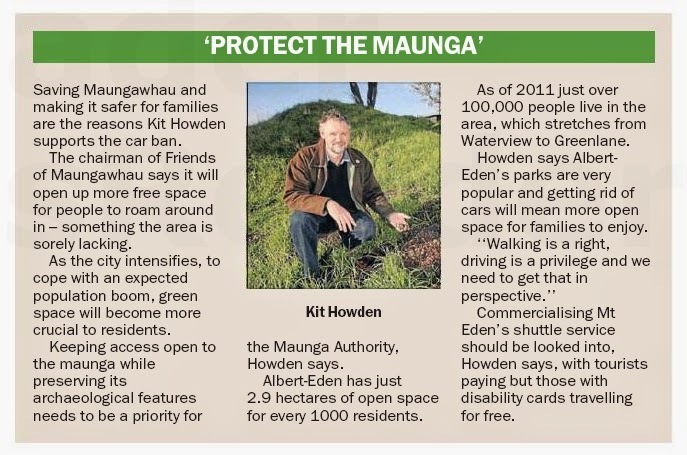 The success of the new Maunga Authority will rest on the funding it gets without robbing other parks like the successful regional parks of Auckland. The Friends of Maungawhau will be advocating for consultation and adequate funding for all these conservation parks in the 10 year financial plan of Auckland. Friends of Maungawhau 10 main advocacy positions. 3 Develop a co-management model founded on professional park rangers supported by contractors and an engaged community of volunteers. E.g. 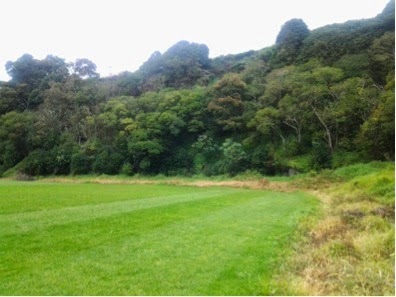 Recently I enquired about a private development on Clive Rd that was suspected of encroaching on Maungawhau – a public reserve under control of the Council. The planning officer could not confirm that a boundary survey was a resource consent requirement and told me “to survey the boundary ourselves if we were that concerned”. Old attitudes and lack of importance towards conservation reserves still dominates the Council so we welcome the new approach and new governance of the maunga. 7 Make operational plans more accessible and establish a mechanism like the former Maungawhau Stakeholders Group to enable designated volunteer organisations to be informed and consulted by the Maunga Authority on policies and plans. 9 Ensure the funding of the maunga and Maunga Authority do not take funds away from the Regional Parks and other conservation and informal parks. E.g. 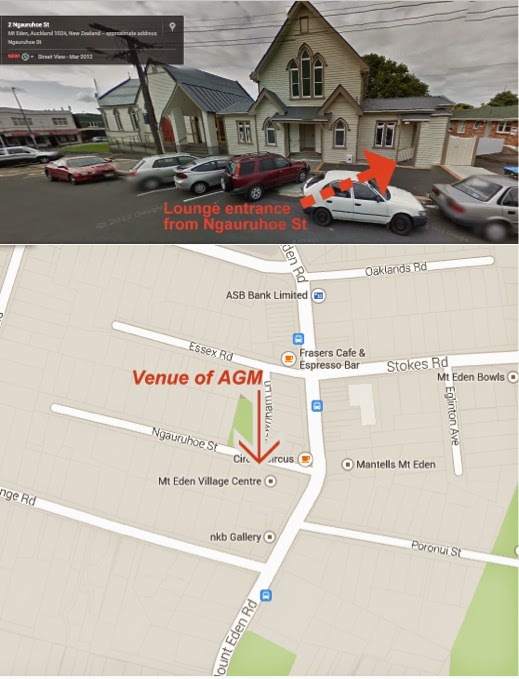 See AGM report from Friends of Maungawhau and Mike Lee’s presentation at the Friends of Regional Parks AGM. Planning for Love Your Mountain Day, Sunday 7 December 2014, has been progressing. The use of the grounds at Government House for the day has been secured. Audrey, April and Kit have met with Paul Majurey, Chair of the Tāmaki Makaurau Collective, and received strong support for the event. Audrey and April will soon be meeting with the manager of Eden Garden to discuss the Garden's involvement. Ideas for the various activities that have been proposed are being developed. 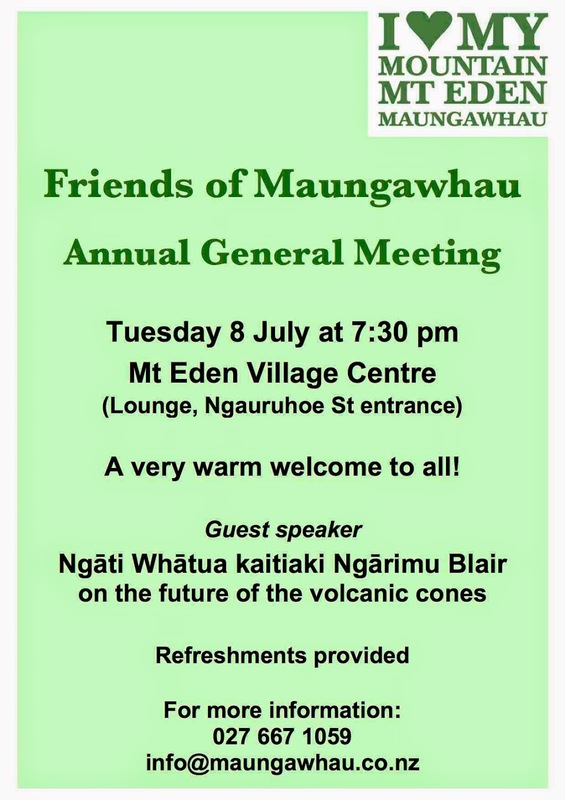 Ngārimu Blair, Ngāti Whātua kaitiaki of Maungawhau and a founding member of FoM, will be the guest speaker at our AGM. This will be a great opportunity to learn about the changes coming up when the Maunga Bill passes into law on 24 July. The legislation transfers ownership of 14 Auckland maunga to iwi that have ancestral connections to the maunga and establishes a co-management structure involving Auckland Council and the Tāmaki Collective. Please contact FoM chair Kit Howden (kithowden[at]xtra.co.nz) for more information. 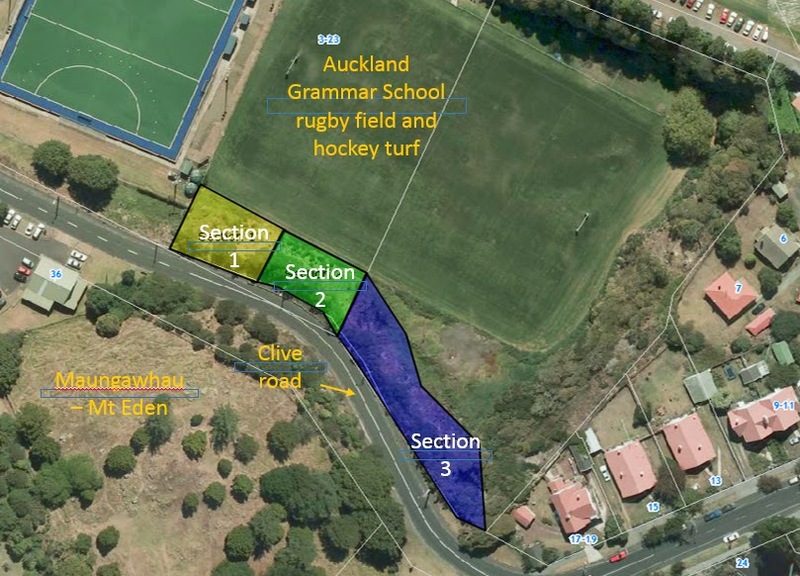 The first community planting day at Auckland Grammar School (Section 1 on the map below) is the result of a unique collaboration between the Friends of Maungawhau, Auckland Council and Roseline Klein who first approached the school about their weed-infested grounds in March 2013. Not a pleasant job, but fascinating to see the amount of accumulated stuff, some of it positively historic, like ancient bottles - huge brown beer bottles, incredibly thick and heavy ones like Fanta and L&P bottles, flagons, green Barossa Pearl ones, and old rectangular ink bottles. Can't blame the current students as these things were out of production decades before they were born! Over a year ago now, my friends Jen and Carl had a brilliant idea when giving birth to the lovely Abby. They asked their friends to celebrate Abby's birth by doing something positive for their community or for themselves instead of giving a material present. I thought about what I could do and realised that on my way to work, I was going past an area covered in weeds on Auckland Grammar School grounds, between Clive Road and the school's hockey turf and lower rugby field. 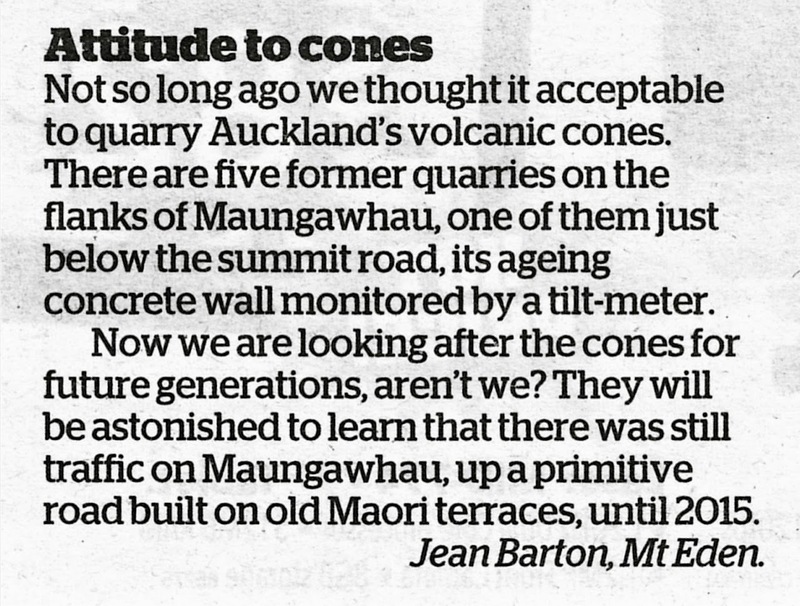 This is very detrimental for the amazing Mt Eden just next to it, where volunteers from Friends of Maungawhau and great people from Auckland Council spend significant time maintaining the mountain and its native bush. But then as a school, AGS doesn't have the expertise to know how to best deal with the issue and understandably has other priorities. The community needed to help to make change happen. Section 1 – Pampas and moth plant seedlings. A year down the track, a joined weeding and planting project has been created between AGS, Friends of Maungawhau, Auckland Council and myself. Thanks to funding by Auckland Council (EIF) and Auckland Grammar School, weeding has been done on site in the past 8 months. Thanks to time and effort by Friends of Maungawhau, the cans and bottles thrown over time by people on the area have started to be collected. The area is now ready to be planted with native bush, aiming at increased biodiversity, reduced weed issues and improved aesthetics for the enjoyment of all. How exciting! I would love for you to be part of it! Our first significant milestone is the planting day on Sunday 22 June, 10am to 4pm. 500 shrubs will be planted on Section 1. The school's Environmental Committee and Communications team are advertising the day to parents. To make this day a success, there will need to be a lot of us. All help is welcome, yours especially! If you feel like contributing to our beautiful Auckland and are free that day, please come along! It should be a fun day. If you know of anyone who would be interested, don't hesitate to share the invite. I will send you more information closer to the date. For now, just rsvp if you'd like to join! Happy May Day! Morris dancers gathered on the summit of Maungawhau at dawn today, and performed energetic jigs and stick dances to the accompaniment of an accordion, squeeze box, fiddle, drums, guitar and Irish wooden flute. Those wearing the felt admiral hats are from the City of Auckland Morris Dancers. The chaps in the top hats drove up overnight from Wellington, and a man crowned with fruit and flowers had come from Brisbane. There weren't as many spectators as in past years, we're told, but the Friends of Maungawhau contingent included many of our core weeding group plus Audrey, organiser of this year's Love Your Mountain Day who'd biked up from the CBD. A beautiful morning, with the Southern Cross fading low in the western sky and the sun rising above the trig station. with the Friends of Maungawhau weeding group.